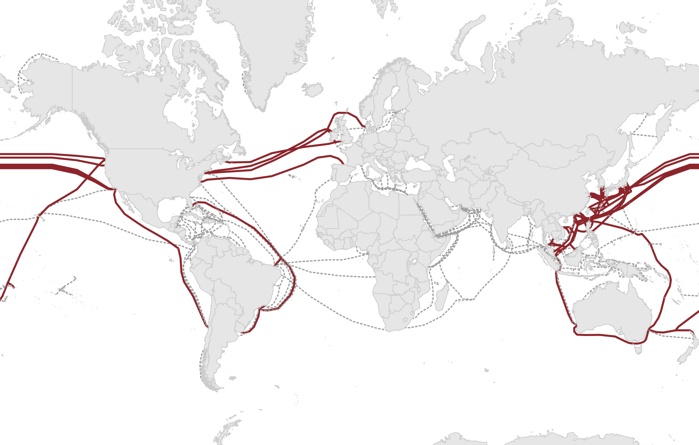 Why are Content Providers Building Submarine Cables? Persistent demand growth and price erosion couple with shifts in sources of demand and changes in network deployment strategies to create challenges for the wholesale telecom market. The following are a few of the key trends that will affect the long-haul capacity market in the coming years. Content providers’ cable investments have largely focused on trans-Atlantic, trans-Pacific, U.S.-Latin American, and intra-Asian routes thus far. Other routes are likely to draw content provider-backed cable construction in the near future. In particular, India-Singapore, India-Europe, and Europe-Africa may attract content provider interest in new systems. In some countries, content providers may not possess the legal or regulatory authority to land cables themselves and may need to rely on carriers or specialist companies who can operate a cable on their behalf. While the number of content providers involved in building submarine cables has been limited thus far to a handful of U.S.-based companies, new entrants are likely to emerge. In particular, the Chinese content providers Baidu, Alibaba, and Tencent (sometimes collectively referred to as BATs) are aggressively expanding their cloud computing platforms globally. While their requirements seem relatively modest at present, they are growing rapidly. These content providers—or Chinese carriers purchasing fiber pairs on their behalf—could be key members of new cables builds in the future. TeleGeography's Global Bandwidth Research Service provides the most comprehensive, reliable research for both submarine cables and long-haul networks. Fill out the form on this page to download our latest executive summary to learn more.